"I SEE -PERCEIVE, THEREFORE I AM." 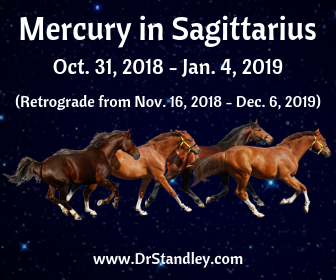 Mercury in Sagittarius from October 31, 2018 - January 4, 2019. The reason why this Mercury transit is so long is because Mercury turned Retrograde (Rx) on Friday, November 16, 2018 until Thursday, December 6, 2018. 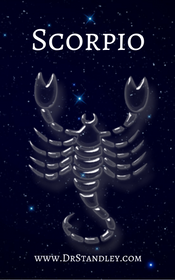 During the Retrograde period Mercury in Sagittarius Retrograded so far that it took us back to Mercury in Scorpio at 27 degrees. Mercury enters its 'shadow' period usually around two (2) weeks before it turns Retrograde where you can feel the pre-retrograde prodrome (early symptom) of Mercury Retrograde. Mercury usually moves at about 1 degree to 2 degrees per day and often times it will move 01 degree one day and then 02 degrees the next day, then 01 degree the next day and then 02 degrees the next day, which is pretty dang fast. It's not as fast as the Moon, but it is fast. When Mercury enters its shadow period you can see the degrees fan out for longer periods of time. Then Mercury will enter its 'storm' about a week before it turns Retrograde and we will be able to really start feeling the effects of Mercury turning Retrograde. So Mercury remains at the same degree for longer periods of time during the Retrograde period. We really saw this on November 8th and 9th when Mercury remained at 09 degrees for two solid days instead of changing 02 degrees in one single day as it normally would. We began seeing the slow down of Mercury on November 8th and 9th. 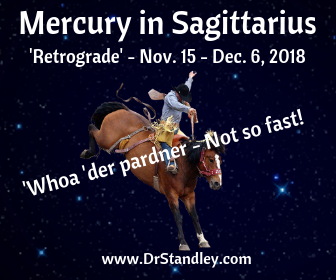 You may have felt even earlier at very subtle levels but on November 8th and 9th, it was pretty dang evident, which meant Mercury entered its pre-retrograde-storm period, which was stormy, just like a storm. Mercury in its storm occurs just before Mercury turns Retrograde. 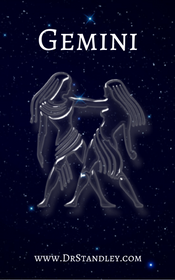 Mercury is in its post-retrograde-storm for right at about a week after it turns Direct, which releases this time around on Wednesday, December 12, 2018. When Mercury turned Direct on Thursday, December 6, 2018 it took a week for it to get back up to its normal speed of moving 01 to 02 degrees per day. 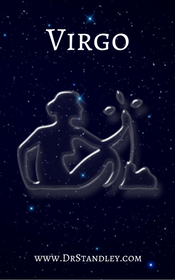 Again, that release occurs on December 12, 2018, which is the same day that Mercury re-enters Sagittarius. Mercury will still be in its shadow for about 2 weeks before and after it is Retrograde, which takes us up to December 20th, but that week before and week after Mercury is Retrograde can be just as intense as the period of time when Mercury is actually Retrograde. So pretty much after December 12th, you can make your electronic, gadgetry or automobile purchases again. You can also begin scheduling any surgeries or doctor appointments after December 12th because Mercury rules the surgeons or doctors hands. You can also sign important paperwork, documents, leases, ownership papers or partnership agreements on or after December 12th. It's quite a long time but you won't regret it if you stick to the rules of Mercury Retrograde. Still, ideally, two weeks before and two weeks after the Retrograde period would be the absolute best. 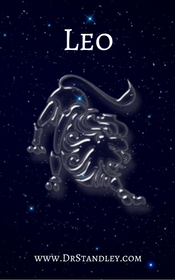 It is important to note that Mercury in Sagittarius is in its 'Detriment'. The 'detrimental' placement is like a feisty child throwing a temper tantrum in the grocery store. Basically, it acts out inappropriately at the wrong time and wrong place. This is because Sagittarius opposes Gemini and Mercury naturally rules Gemini. 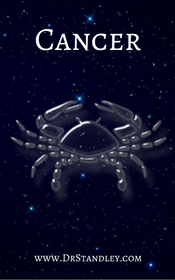 Sagittarius also squares Virgo, which is also ruled by Mercury. So you can see, this is a double-whammy of a 'detrimental' placement for Mercury. This communication is like a 4 year old asking an overweight woman if there is a baby in her belly. It's just inappropriate communication. The 'Detri-mental' placement is interesting here because Mercury is the 'mental' planet of the zodiac and being in an 'out of place' space can make communication somewhat difficult and probably offensive. There is a demand for mental freedom where there is a tendency to say what one thinks without thinking of the consequences. This can also lead to social conformity (going along with the crowd) and when carried too far it can lead to hypocrisy because your morals standards may be no better than the next guy. 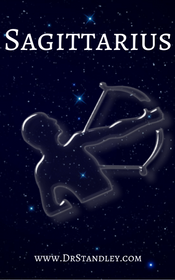 Sagittarius is the sign of society at large (really large) in fact global. 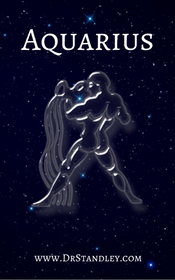 Mercury rules the mind and mental abilities. So here we have codification of social thought and the moral compass. The arm chair philosophers and religious fanatics come out of the woodwork. Pay attention to what others are saying because they are more concerned about the attitude and approach than the facts. 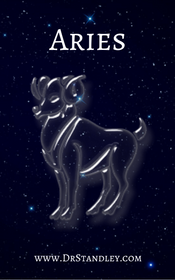 Mercury in Sagittarius is out of place and next thing ya' know, one tiny little remark turns into a religious discussion or a political dog fight. This reminds me of when I made a comment on Facebook about grocery shopping and someone else responded with a religious comment. 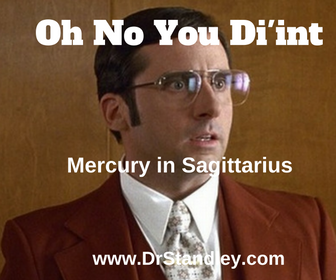 It came out of left field and I thought, "Wow, that is so Mercury in Sagittarius." It was out of place! Now pay attention to your energy more than anyone else's because if you are living Life as a hypocrit, then you will be called out on it. In some form or another, if we are all honest with ourselves, we can see how we are hypocrits. Look internally folks, this placement is for you to work on you, not for you to point fingers at someone else's moral code when you are not living within your own. When this energy is harnassed, tamed and controlled, then it can provide the individual with profound insight and quite possibly, prophecy. These individuals can read public opinion like an open book. 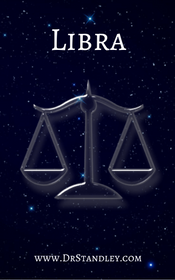 Mercury rules the mind and Sagittarius is bold, frank and blunt, so this transit will cause all of us to say exactly what is on our mind. Those with this placement in their natal chart always say what is on their mind and now it will just be more of the same, only layers of it. 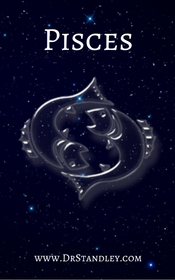 These individuals with Mercury in Sagittarius will often feel as though others are trying to tell them what to think, when maybe others are just trying to get them to shut up. Sorry folks, but Mercury in Sagittarius can make you want to say STFU (Shut the 'f' up) to a lot of people who have diarrhea of the mouth or who can't take a breath long enough to let others speak. This transit is so bold and blunt, there will be a lot of hypocritical accusations thrown around and many cans of worms opened because someone 'went there'. We are going to see a lot of Truth seekers during this transit and then those with this placement in their natal chart will likely let you know that they are the authority of 'Truth'. 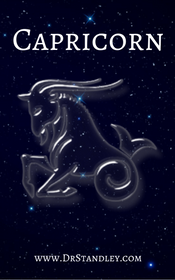 Depending on how the individual with Mercury in Sagittarius in their natal chart is aspected will tell whether all their sermonizing hits home or falls on deaf ears. Stay Astrologized™. 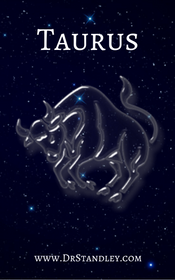 Anytime on or after Wednesday - December 12, 2018 click your Sun Sign below and go to your Monthly Horoscope to read how it impacts your entire Sun Sign.